Dismissed as a political greenhorn, engineer-turned-civil servant Arvind Kejriwal has cemented his place in politics with a stunning political debut for his nascent AAP and emerged as a giant killer to sweep Sheila Dikshit out from not only office but also her constituency. Belying all claims of being a "non-actor or no factor" in the Delhi assembly elections by Congress and BJP, Kejriwal was largely instrumental in snapping the 15-year rule of incumbent Chief Minister. Adding to her misery was the defeat in her own turf -- New Delhi constituency -- by a huge margin of 25,864 votes. Often poked fun at by politicians, the 45-year-old former Indian Revenue Service officer was challenged by none other than senior Congress leader Kapil Sibal in -- not to criticise the political system as an outsider but join it to cleanse it from within. 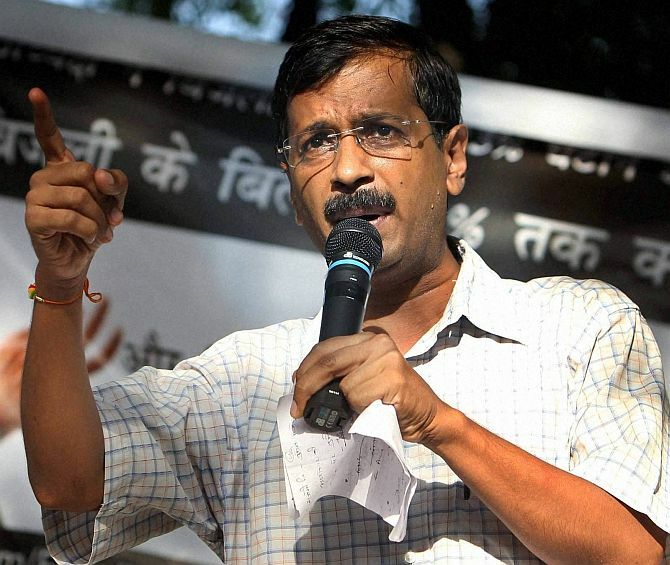 In the past one year, if there was one person who sent the entire political spectrum into a tizzy it was undoubtedly Kejriwal, who attacked both BJP and Congress on the issues of corruption, exorbitant rise in power and water tariff, safety of women and had managed to make a dent in the vote banks of both the parties. Soft-spoken but a man with strong conviction, the Ramon Magsaysay award winner came into prominence from the agitation by 75-year-old activist Anna Hazare in support of Jan Lokpal Bill in 2011. He was part of the Team Anna, along with first woman IPS officer Kiran Bedi, Prashant Bhushan and others. He was the civil society representative member of the committee constituted by the Government to draft the Jan Lokpal bill, following the campaign for introduction of such legislation. After feeling "betrayed" by the government when it rejected their draft, Congress and other leaders challenged them to join politics, win elections and come to Parliament if they wanted to "fight system from within", root out corruption and get the Jan Lokpal Bill passed. Known for taking on challenges, the indefatigable activist decided to take a plunge into politics and formed "Aam Aadmi Party" on November 26 last year, after a formal split of Team Anna. The party name -- Aam Aadmi Party -- reflects the phrase Aam Aadmi or "common man", whose interests Kejriwal proposed to represent and got its poll symbol "broom" in July this year. The party started its poll preparation way ahead in April with an emphasis to field only candidates with a "clean image" for all the 70 assembly constituencies. 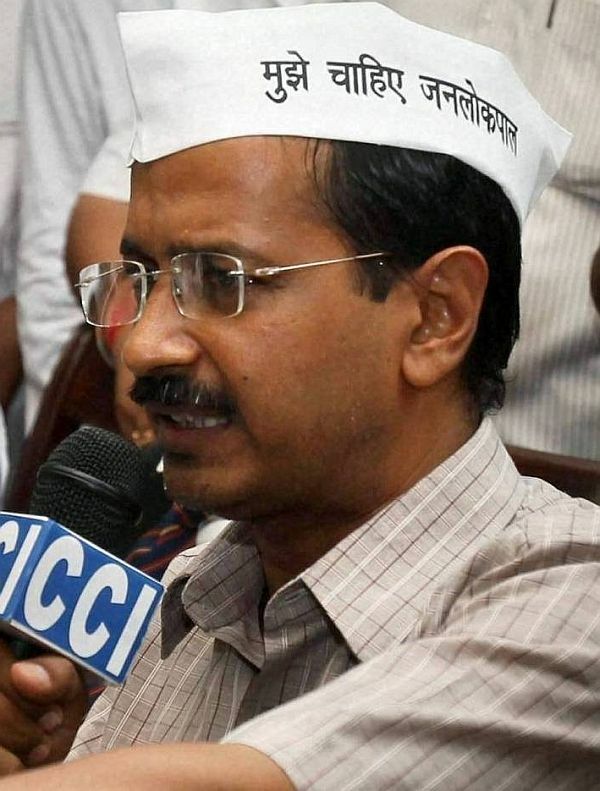 For taking on seasoned politicians like three-time Delhi Chief Minister Sheila Dikshit and other BJP leaders, Kejriwal and his party tried different strategies like going on 15-day long hunger strike on the issue of power tariff in May. And to inject some drama, the anti-corruption crusader even filed his papers on November 16 on the last date of filing of nominations, after Dikshit filed her nomination, just to ensure a straight fight with her. To woo the electors, the party put up posters on auto-rickshaws against Dikshit flagging burning issues of women safety, corruption and high power and water tariffs. Thousands of AAP volunteers, from Delhi and outside and even abroad, joined him in the hope that Kejriwal would do a miracle. They even took sabbaticals to join his movement. The volunteers conducted street plays, put up banners hanging across flyovers to gain the attention of 1.19 crore Delhi voters. Stressing on transparency, the party did which was unthinkable of putting their funds in public domain and making it accessible to all. Among the other firsts, he and his party decided to come up with 70 assembly-based manifestos and a common one for Delhi, which was followed by the BJP but it failed to bring out more than one or two. Known as meticulous planner, Kejriwal and his team planned every thing right down to the booth level to help swung votes in their favour. Even selection of party symbol "broom" was part of their plans to strike a chord with the balmiki community, who mostly work as safaikaramcharis in the three BJP-led municipal corporations, which used to be perceived as a traditional Congress vote bank. Born on August 16, 1968 in Hisar in Haryana to Gobind Ram Kejriwal and Gita Devi, Arvind is a Mechanical Engineering graduate of Indian Institute of Technology Kharagpur. After completing his engineering, he joined Tata Steel in 1989 and after working for three years, he resigned in 1992. He later joined Indian Revenue Service in 1995 after qualifying the Civil Services Examination. Being in government service, Kejriwal was active in taking up social cause and worked for implementation of Right to Information Act at grass root level. His efforts in the enactment of the RTI Act to empower the poorest citizens of India won him the Ramon Magsaysay Award for Emergent Leadership in 2006. In February 2006, after resigning from the lucrative government job from the post of Joint Commissioner in the Income Tax Department he become a full-time activist and started an NGO, Public Cause Research Foundation, with his award money as a corpus fund. Kejriwal is married to Sunita, who is also an IRS officer and his batch mate from National Academy of Administration in Mussoorie. The couple have two children, a daughter and a son. He has a younger sister and brother. But unlike, other political leaders, Kejriwal had to face several controversies related to funds and a sting by a webportal. 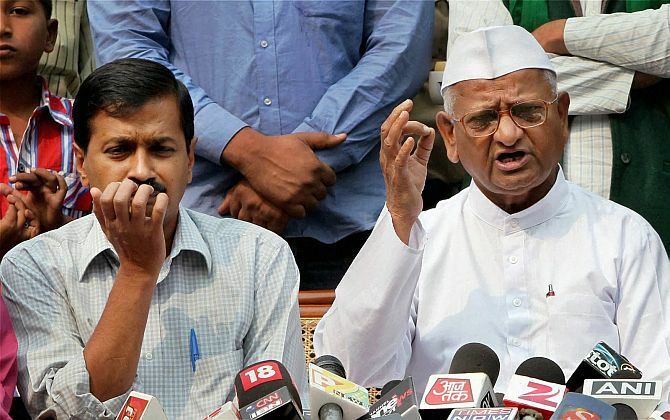 Opposition parties repeatedly termed AAP and Kejriwal as "back-stabber" and one who had stabbed at the back of Anna Hazare to fulfil his political ambitions. They even questioned the party accepting funds from abroad from NRIs. A PIL was also filed in the Supreme Court, which directed the government to probe the matter. 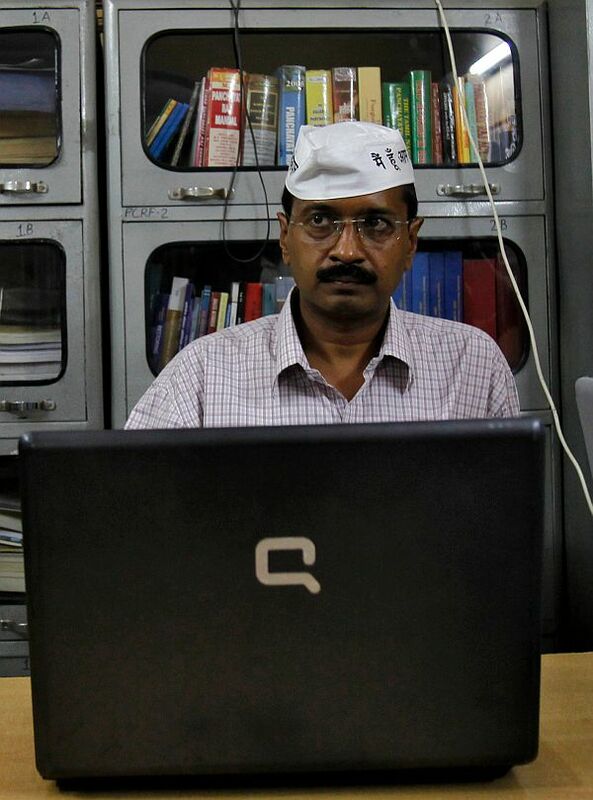 During the last phase of election campaign, a sting operation carried out by a little known webportal, claimed to have exposed how AAP volunteers were ready to support anyone who offered to fund their party. The party's political affairs committee themselves went through the unedited footage found that the sting was carried out to malign the AAP image and not the entire truth was aired.